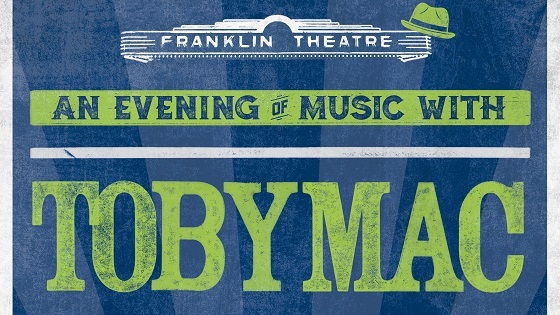 Franklin Theatre - An Evening of Music with TobyMac - SOLD OUT! An Evening of Music with TobyMac - SOLD OUT! $85 • $100 Additional fees may apply - SOLD OUT! “An Evening of Music” featuring Christian Artist TobyMac. This is an Annual event, benefitting Franklin Christian Academy, and will be held on May 15, 2018, at 8pm, with doors opening at 7:30pm. Special Donor and VIP packages are available through FCA directly, or you can purchase tickets through the Franklin Theatre. The VIP packages also include a pre-show Meet & Greet with Toby Mac, and Early Entry at 6:30pm. The host of this event has requested Franklin Theatre provide a list of ticketed patrons in order to acknowledge their contribution. By purchasing tickets, you will be granting Franklin Theatre permission to share any and all contact information you provide with the Franklin Christian Academy. If you have any questions in this regard, please contact the Franklin Theatre.